"Thames" and "Tamesis" redirect here. For other uses of "Thames", see Thames (disambiguation). For the town in Colombia, see Támesis, Antioquia. For the publisher, see Tamesis Books. The River Thames (/tɛmz/ ( listen) TEMZ), known alternatively in parts as the Isis, is a river that flows through southern England including London. At 215 miles (346 km), it is the longest river entirely in England and the second longest in the United Kingdom, after the River Severn. It flows through Oxford (where it is called the Isis), Reading, Henley-on-Thames and Windsor. The lower reaches of the river are called the Tideway, derived from its long tidal reach up to Teddington Lock. It rises at Thames Head in Gloucestershire, and flows into the North Sea via the Thames Estuary. The Thames drains the whole of Greater London. Its tidal section, reaching up to Teddington Lock, includes most of its London stretch and has a rise and fall of 23 feet (7 m). Running through some of the driest parts of mainland Britain and heavily abstracted for drinking water, the Thames' discharge is low considering its length and breadth: the Severn has a discharge almost twice as large on average despite having a smaller drainage basin. In Scotland, the Tay achieves more than double the Thames' average discharge from a drainage basin that is 60% smaller. Along its course are 45 navigation locks with accompanying weirs. Its catchment area covers a large part of south-eastern and a small part of western England; the river is fed by at least 50 named tributaries. The river contains over 80 islands. With its waters varying from freshwater to almost seawater, the Thames supports a variety of wildlife and has a number of adjoining Sites of Special Scientific Interest, with the largest being in the remaining parts of the North Kent Marshes and covering 5,449 hectares (13,460 acres). The Thames, from Middle English Temese, is derived from the Brittonic Celtic name for the river, Tamesas (from *tamēssa), recorded in Latin as Tamesis and yielding modern Welsh Tafwys "Thames". The name may have meant "dark" and can be compared to other cognates such as Russian темно (Proto-Slavic *tĭmĭnŭ), Lithuanian tamsi "dark", Latvian tumsa "darkness", Sanskrit tamas and Welsh tywyll "darkness" (Proto-Celtic *temeslos) and Middle Irish teimen "dark grey". The same origin is shared by countless other river names, spread across Britain, such as the River Tamar at the border of Devon and Cornwall, several rivers named Tame in the Midlands and North Yorkshire, the Tavy on Dartmoor, the Team of the North East, the Teifi and Teme of Wales, the Teviot in the Scottish Borders, as well as one of the Thames' tributaries called the Thame. Kenneth H. Jackson has proposed that the name of the Thames is not Indo-European (and of unknown meaning), while Peter Kitson suggested that it is Indo-European but originated before the Celts and has a name indicating "muddiness" from a root *tā-, 'melt'. Indirect evidence for the antiquity of the name 'Thames' is provided by a Roman potsherd found at Oxford, bearing the inscription Tamesubugus fecit (Tamesubugus made [this]). It is believed that Tamesubugus' name was derived from that of the river. Tamese was referred to as a place, not a river in the Ravenna Cosmography (c. AD 700). The Thames through Oxford is sometimes called the Isis. Historically, and especially in Victorian times, gazetteers and cartographers insisted that the entire river was correctly named the Isis from its source down to Dorchester on Thames and that only from this point, where the river meets the Thame and becomes the "Thame-isis" (supposedly subsequently abbreviated to Thames) should it be so called. Ordnance Survey maps still label the Thames as "River Thames or Isis" down to Dorchester. However, since the early 20th century this distinction has been lost in common usage outside of Oxford, and some historians suggest the name Isis is nothing more than a truncation of Tamesis, the Latin name for the Thames. Sculptures titled Tamesis and Isis by Anne Seymour Damer can be found on the bridge at Henley-on-Thames, Oxfordshire (the original terracotta and plaster models were exhibited at the Royal Academy, London, in 1785. They are now on show at the River and Rowing Museum in Henley). Richard Coates suggests that while the river was as a whole called the Thames, part of it, where it was too wide to ford, was called *(p)lowonida. This gave the name to a settlement on its banks, which became known as Londinium, from the Indo-European roots *pleu- "flow" and *-nedi "river" meaning something like the flowing river or the wide flowing unfordable river. The river gives its name to three informal areas: the Thames Valley, a region of England around the river between Oxford and West London; the Thames Gateway; and the greatly overlapping Thames Estuary around the tidal Thames to the east of London and including the waterway itself. Thames Valley Police is a formal body that takes its name from the river, covering three counties. In non-administrative use, the river's name is used in those of Thames Valley University, Thames Water, Thames Television, publishing company Thames & Hudson, Thameslink (north-south railways passing through central London) and South Thames College. An example of its use in the names of historic entities is the Thames Ironworks and Shipbuilding Company. Rowing and sailing clubs are common along the Thames, which is navigable to such vessels. Kayaking and canoeing also take place. 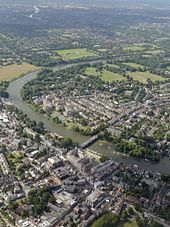 Major annual events include the Henley Royal Regatta and the Boat Race, while the Thames has been used during two Summer Olympic Games: 1908 (rowing) and 1948 (rowing and canoeing). Safe headwaters and reaches are a summer venue for organised swimming, which is prohibited on safety grounds in a stretch centred on Central London. However, Seven Springs near Cheltenham, where the Churn (which feeds into the Thames near Cricklade) rises, is also sometimes quoted as the Thames' source, as this location is furthest from the mouth, and adds some 14 miles (23 km) to the river's length. At Seven Springs above the source is a stone with the Latin hexameter inscription "Hic tuus o Tamesine pater septemgeminus fons", which means "Here, O Father Thames, [is] your sevenfold source". The springs at Seven Springs flow throughout the year, while those at Thames Head are only seasonal (a winterbourne). The Thames is the longest river entirely in England. (The longest river in the United Kingdom, the Severn, flows partly in Wales). However, as the River Churn, sourced at Seven Springs, is 14 miles (23 km) longer than the section of the Thames from its traditional source at Thames Head to the confluence, the overall length of the Thames measured from Seven Springs, at 229 miles (369 km), is greater than the Severn's length of 220 miles (350 km). Thus, the "Churn/Thames" river may be regarded as the longest natural river in the United Kingdom. The stream from Seven Springs is joined at Coberley by a longer tributary which could further increase the length of the Thames, with its source in the grounds of the National Star College at Ullenwood. Molesey faces Hampton, and in Greater London the Thames passes Hampton Court Palace, Surbiton, Kingston upon Thames, Teddington, Twickenham, Richmond (with a famous view of the Thames from Richmond Hill), Syon House, Kew, Brentford, Chiswick, Barnes, Hammersmith, Fulham, Putney, Wandsworth, Battersea and Chelsea. In central London, the river passes Pimlico and Vauxhall, and then forms one of the principal axes of the city, from the Palace of Westminster to the Tower of London. At this point, it historically formed the southern boundary of the medieval city, with Southwark, on the opposite bank, then being part of Surrey. Sediment cores up to 10 m deep collected by the British Geological Survey from the banks of the tidal River Thames contain geochemical information and fossils which provide a 10,000-year record of sea-level change. Combined, this and other studies suggest that the Thames sea-level has risen more than 30 m during the Holocene at a rate of around 5–6 mm per year from 10,000 to 6,000 years ago. The rise of sea level dramatically reduced when the ice melt nearly concluded over the past 4,000 years. Since the beginning of the 20th century, rates of sea level rise range from 1.22 mm per year to 2.14 mm per year. The Nore is the sandbank that marks the mouth of the Thames Estuary, where the outflow from Thames meets the North Sea. It is roughly halfway between Havengore Creek in Essex and Warden Point on the Isle of Sheppey in Kent. Until 1964 it marked the seaward limit of the Port of London Authority. As the sandbank was a major hazard for shipping coming in and out of London, in 1732 it received the world's first lightship. This became a major landmark, and was used as an assembly point for shipping. Today it is marked by Sea Reach No. 1 Buoy. In the Oxford area the river splits into several streams across the floodplain (Seacourt Stream, Castle Mill Stream, Bulstake Stream and others), creating several islands (Fiddler's Island, Osney and others). Desborough Island, Ham Island at Old Windsor and Penton Hook Island were artificially created by lock cuts and navigation channels. Chiswick Eyot is a landmark on the Boat Race course, while Glover's Island forms the centre of a view from Richmond Hill. Islands of historical interest include Magna Carta Island at Runnymede, Fry's Island at Reading, and Pharaoh's Island near Shepperton. In more recent times Platts Eyot at Hampton was the place where Motor Torpedo Boats (MTB)s were built, Tagg's Island near Molesey was associated with the impresario Fred Karno and Eel Pie Island at Twickenham was the birthplace of the South East's R&B music scene. This created a new river course through Berkshire and on into London, after which the river rejoined its original course in southern Essex, near the present River Blackwater estuary. Here it entered a substantial freshwater lake in the southern North Sea basin, south of what is called Doggerland. The overspill of this lake caused the formation of the Channel River and later the Dover Strait gap between Britain and France. Subsequent development led to the continuation of the course that the river follows at the present day. The last advance from that Scandinavian ice flow to have reached this far south covered much of north west Middlesex and finally forced the Proto-Thames to take roughly its present course. At the height of the last ice age, around 20,000 BC, Britain was connected to mainland Europe by a large expanse of land known as Doggerland in the southern North Sea basin. At this time, the Thames' course did not continue to Doggerland but flowed southwards from the eastern Essex coast where it met the Rhine, the Meuse and the Scheldt flowing from what are now the Netherlands and Belgium. These rivers formed a single river – the Channel River (Fleuve Manche) – that passed through the Dover Strait and drained into the Atlantic Ocean in the western English Channel. On 20 January 2006, a 16–18 ft (4.9–5.5 m) northern bottle-nosed whale was seen in the Thames as far upstream as Chelsea. This was extremely unusual: this whale is generally found in deep sea waters. Crowds gathered along the riverbanks to witness the spectacle but there was soon concern, as the animal came within yards of the banks, almost beaching, and crashed into an empty boat causing slight bleeding. About 12 hours later, the whale is believed to have been seen again near Greenwich, possibly heading back to sea. A rescue attempt lasted several hours, but the whale died on a barge. See River Thames whale. The next Roman bridges upstream were at Staines) on the Devil's Highway between Londinium and Calleva (Silchester). Boats could be swept up to it on the rising tide with no need for wind or muscle power. 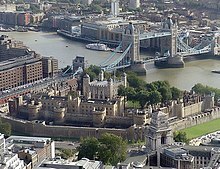 As early as the 1300s, the Thames was used to dispose of waste matter produced in the city of London, thus turning the river into an open sewer. In 1357, Edward III described the state of the river in a proclamation: "... dung and other filth had accumulated in divers places upon the banks of the river with ... fumes and other abominable stenches arising therefrom." Throughout early modern history the population of London and its industries discarded their rubbish in the river. This included the waste from slaughterhouses, fish markets, and tanneries. The buildup in household cesspools could sometimes overflow, especially when it rained, and was washed into London's streets and sewers which eventually led to the Thames. In the late 18th and 19th centuries people known as Mudlarks scavenged in the river mud for a meagre living. In the 19th century the quality of water in Thames deteriorated further. The dumping of raw sewage into the Thames was formerly only common in the City of London, making its tideway a harbour for many harmful bacteria. Gas manufactories were built alongside the river, and their by-products leaked into the water, including spent lime, ammonia, cyanide, and carbolic acid. The river had an unnaturally warm temperature caused by chemical reactions in the water, which also removed the water's oxygen. 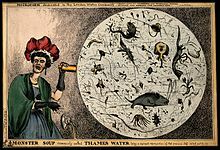 Four serious cholera outbreaks killed tens of thousands of people between 1832 and 1865. Historians have attributed Prince Albert's death in 1861 to typhoid that had spread in the river's dirty waters beside Windsor Castle. Wells with water tables that mixed with tributaries (or the non-tidal Thames) faced such pollution with the widespread installation of the flush toilet in the 1850s. In the 'Great Stink' of 1858, pollution in the river reached such an extreme that sittings of the House of Commons at Westminster had to be abandoned. Chlorine-soaked drapes were hung in the windows of Parliament in an attempt to stave off the smell of the river, but to no avail. In the post-war era, although the Port of London remains one of the UK's three main ports, most trade has moved downstream from central London. In the late 1950s, the discharge of methane gas in the depths of the river caused the water to bubble, and the toxins wore away at boats' propellers. The decline of heavy industry and tanneries, reduced use of oil-pollutants and improved sewage treatment have led to much better water quality compared to the late 19th and early- to mid-20th centuries and aquatic life has returned to its formerly 'dead' stretches. In the early 1980s a pioneering flood control device, the Thames Barrier, was opened. It is closed to tides several times a year to prevent water damage to London's low-lying areas upstream (the 1928 Thames flood demonstrated the severity of this type of event). In the late 1990s, the 7-mile (11 km) long Jubilee River was built as a wide "naturalistic" flood relief channel from Taplow to Eton to help reduce the flood risk in Maidenhead Windsor and Eton. In 2010, the Thames won the largest environmental award in the world – the $350,000 International Riverprize. In the past, commercial activities on the Thames included fishing (particularly eel trapping), coppicing willows and osiers which provided wood, and the operation of watermills for flour and paper production and metal beating. These activities have disappeared. A screw turbine hydro-electric plant at Romney Lock to power Windsor Castle using two Archimedes' screws was opened in 2013 by the Queen. The Thames is maintained for navigation by powered craft from the estuary as far as Lechlade in Gloucestershire and for very small craft to Cricklade. The original towpath extends upstream as far as the connection with the now disused Thames and Severn Canal at Inglesham, one and a half miles upstream of the last boat lock near Lechlade. From Teddington Lock to the head of navigation, the navigation authority is the Environment Agency. Between the sea and Teddington Lock, the river forms part of the Port of London and navigation is administered by the Port of London Authority. Both the tidal river through London and the non-tidal river upstream are intensively used for leisure navigation. The non-tidal River Thames is divided into reaches by the 45 locks. The locks are staffed for the greater part of the day, but can be operated by experienced users out of hours. This part of the Thames links to existing navigations at the River Wey Navigation, the River Kennet and the Oxford Canal. All craft using it must be licensed. The Environment Agency has patrol boats (named after tributaries of the Thames) and can enforce the limit strictly since river traffic usually has to pass through a lock at some stage. A speed limit of 8 km/h (4.3 kn) applies. There are pairs of transit markers at various points along the non-tidal river that can be used to check speed – a boat travelling legally taking a minute or more to pass between the two markers. In 2010, the Thames won the world's largest environmental award at the time, the $350,000 International Riverprize, presented at the International Riversymposium in Perth, WA in recognition of the substantial and sustained restoration of the river by many hundreds of organisations and individuals since the 1950s. Many of the present-day road bridges are on the site of earlier fords, ferries and wooden bridges. At Swinford Bridge, a toll bridge, there was first a ford and then a ferry prior to the bridge being built. 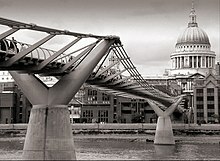 The earliest known major crossings of the Thames by the Romans were at London Bridge and Staines Bridge. At Folly Bridge in Oxford the remains of an original Saxon structure can be seen, and medieval stone bridges such as Newbridge, Wallingford Bridge and Abingdon Bridge are still in use. Railway development in the 19th century resulted in a spate of bridge building including Blackfriars Railway Bridge and Charing Cross (Hungerford) Railway Bridge in central London, and the railway bridges by Isambard Kingdom Brunel at Maidenhead Railway Bridge, Gatehampton Railway Bridge and Moulsford Railway Bridge. Treated sewage from all the towns and villages in the Thames catchment flow into the Thames via sewage treatment plants. This includes all the sewage from Swindon, Oxford, Reading and Windsor. However, untreated sewage still regularly enters the Thames during wet weather. When London's sewerage system was built, sewers were designed to overflow through discharge points along the river during heavy storms. Originally, this would happen once or twice a year, however overflows now happen once a week on average. In 2013, over 55m tonnes of raw sewage was washed into the tidal Thames. These discharge events kill fish, leave raw sewage on the riverbanks, and decrease the water quality of the river. To prevent the release of raw sewage and rainwater into the river, the Thames Tideway Scheme is currently under construction at a cost of £4.2 billion. This project will collect sewage before it overflows, before channeling it down a 25 km (15 mi) tunnel underneath the tidal Thames, so it can be treated at Beckton Sewage Treatment Works. The result of the project will be reduction of sewage discharges into the river by 90%, dramatically increasing water quality. Mercury (Hg) is an environmentally persistent heavy metal which at high concentrations can be toxic to marine life and humans. Sixty sediment cores of 1 m in depth, spanning the entire tidal River Thames, between Brentford and the Isle of Grain have been analysed for total Hg. The sediment records show a clear rise and fall of Hg pollution through history. Mercury concentrations in the River Thames decrease downstream from London to the outer Estuary with the total Hg levels ranging from 0.01 to 12.07 mg/kg, giving a mean of 2.10 mg/kg which is higher than many other UK and European river estuaries. The highest amount of sedimentary-hosted Hg pollution in the Thames estuary occurs in the central London area between Vauxhall Bridge and Woolwich. The majority of sediment cores show a clear decrease in Hg concentrations close to the surface which is attributed to an overall reduction in polluting activities as well as improved effectiveness of recent environmental legalisation and river management (e.g. Oslo-Paris convention). Evaluation of select of lipid compounds in the Thames estuary, known as glycerol dialkyl glycerol tetraethers (GDGTs) has revealed enhanced concentrations of isoprenoid GDGT compounds (crenarchaeol) around East London. This suggests that London's pollution affects the spatial distribution of natural carbon in the river sediments. Other organic geochemical measurements of carbon flow such as stable carbon isotopes (δ13C) were found to be insensitive to this urban disturbance. The University Boat Race (between Oxford and Cambridge) takes place in late March or early April, on the Championship Course from Putney to Mortlake in the west of London. The River Thames has been a subject for artists, great and minor, over the centuries. Four major artists with works based on the Thames are Canaletto, J. M. W. Turner, Claude Monet and James Abbott McNeill Whistler. The 20th-century British artist Stanley Spencer produced many works at Cookham. John Kaufman's sculpture The Diver: Regeneration is sited in the Thames near Rainham. The river and bridges are portrayed as being destroyed – together with much of London – in the film Independence Day 2. Science-fiction novels make liberal use of a futuristic Thames. The utopian News from Nowhere by William Morris is mainly the account of a journey through the Thames valley in a socialist future. The Thames also features prominently in Philip Pullman's His Dark Materials trilogy, as a communications artery for the waterborne Gyptian people of Oxford and the Fens, and as a prominent setting for his novel La Belle Sauvage. The 1947 Thames flood was worst overall 20th-century flood of the River Thames, affecting much of the Thames Valley as well as elsewhere in England during the middle of March 1947 after a very severe winter. The floods were caused by 4.6 inches (120 mm) of rainfall (including snow); the peak flow was 61.7 billion litres (13.6 billion imperial gallons) of water per day and the damage cost a total of £12 million to repair.War damage to some of the locks made matters worse. ^ "Ordnance Survey map". English Heritage. Archived from the original on 24 April 2012. Retrieved 11 December 2018. ^ South Thames Estuary And Marshes SSSI Natural England. Retrieved 16 September 2013. ^ a b Mallory, J.P. and D.Q. Adams (1947). The Encyclopedia of Indo-European Culture. London: Fitzroy and Dearborn. p. 147. ^ Jackson, Kenneth H (1955). "The Pictish Language". in F. T. Wainright (ed.). The Problem of the Picts. Edinburgh: Nelson. pp. 129–166. ^ Kitson, Peter R (1996). "British and European River Names'". Transactions of the Philological Society. 94 (2): 73–118. doi:10.1111/j.1467-968X.1996.tb01178.x. ^ Ellis Sandoz (ed.). The Roots of Liberty: Magna Carta... Indianapolis: Amagi/Liberty Fund. pp. 39, 347. ^ Kendal, Roger; Bowen, Jane; Wortley, Laura (2002). Genius & Gentility: Henley in the Age of Enlightenment. Henley-on-Thames: River and Rowing Museum. pp. 12–13. ISBN 9780953557127. ^ Bailey, David (15 May 2012). "Tracing the source of the Thames". BBC News – via www.bbc.co.uk. ^ Dorothy Hart (9 May 2004). "Seven Springs and the Churn". The-river-thames.co.uk. Retrieved 17 May 2010. ^ Winn, Christopher (19 April 2018). I Never Knew That about the River Thames. Ebury Publishing. ISBN 9780091933579 – via Google Books. ^ a b c The Environment Agency (5 October 2011). "Environment Agency More about the Thames River Basin District". web page. The Environment Agency. Archived from the original on 8 September 2011. Retrieved 6 November 2011. ^ "Flow Gauging on the River Thames – The First 100 Years" (PDF). PDF file. Hydrological Data 1983. 1983. p. 33. Retrieved 9 November 2011. ^ "Flow Gauging on the River Thames – The First 100 Years" (PDF). PDF file. Hydrological Data 1983. 1983. p. 35. Retrieved 9 November 2011. ^ "UK Rivers Guide Book Guide to the River Thames – Jubilee River". Ukriversguidebook.co.uk. 23 January 2011. Retrieved 2 April 2012. ^ "Environment Agency – A map indicating the location and route of the Jubilee River" (PDF). 30 September 2007. Archived from the original (PDF) on 30 September 2007. Retrieved 2 April 2012. ^ "Report of the designated sewerage company for the entire Thames Basin and major supplier of London's water supply: Thames Water" (PDF). ^ "River Thames Free Fishing". River Thames Alliance. Retrieved 10 June 2010. ^ "History of the major rivers of southern Britain during the Tertiary". Quaternary Palaeoenvironments Group. 2006. Retrieved 28 November 2007. ^ "The early Ice Age". www.geoessex.org.uk. Retrieved 7 February 2016. ^ "Essex Wildlife Trust, The Geology of Essex". Archived from the original on 21 October 2012. ^ a b c "History of the northwest European rivers during the past three million years". Quaternary Palaeoenvironments Group. 2007. Retrieved 28 November 2007. ^ "Retro: A river worth preserving". Ealing Gazette. 18 February 2011. Retrieved 2 April 2012. ^ a b Anthony David Mills (2001). Oxford Dictionary of London Place Names. Oxford University Press. ISBN 978-0-19-280106-7. ^ The New Oxford Dictionary of English (1998) ISBN 0-19-861263-X p. 582 "East End the part of London east of the City as far as the River Lea, including the Docklands"
^ Peter Ackroyd, Thames: The Biography. 275. ^ Stevenson, Chris (19 August 2013). "Seal count discovers over 700 in Thames Estuary". The Independent. London. Retrieved 23 August 2013. ^ "Whales, dolphins and seals returning to the Thames". Wildlife Extra. September 2007. Retrieved 23 August 2013. ^ "Lost whale dies after rescue bid". BBC News. 21 January 2006. Retrieved 22 October 2007. ^ Needham, P. (1985). "Neolithic And Bronze Age Settlement on the Buried Floodplains of Runnymede". Oxford Journal of Archaeology. 4 (2): 125–137. doi:10.1111/j.1468-0092.1985.tb00237.x. ^ Lamdin-Whymark, H. (2001). "Neolithic activity on the floodplain of the river Thames at Dorney". Lithics. 22. ^ a b The Physique of Middlesex, A History of the County of Middlesex: Volume 1: Physique, Archaeology, Domesday, Ecclesiastical Organisation, The Jews, Religious Houses, Education of Working Classes to 1870, Private Education from Sixteenth Century (1969), pp. 1–10. Date Retrieved 11 August 2007. ^ a b Peter Ackroyd, Thames: The Biography, New York: Doubleday, 2007. "Filthy River"
^ "Frost Fairs, London, UK". BBC. Retrieved 21 March 2007. ^ "London, River Thames and Tower Bridge". VR London. Retrieved 21 March 2007. ^ "Thames and Waterways". London Borough of Hammersmith & Fulham. Archived from the original on 15 April 2015. Retrieved 17 April 2015. ^ a b Peter Ackroyd, Thames: The Biography. 272 & 274. ^ Environment Agency (2005). Jubilee River Archived 25 February 2010 at the Wayback Machine. ^ "Thiess International Riverprize – International RiverFoundation". riverfoundation.org.au. ^ "Queen goes green to light Windsor Castle with hydro-electric power". Daily Mail. 12 July 2013. Retrieved 14 September 2014. ^ "Salters Steamers website". Salterssteamers.co.uk. Archived from the original on 29 May 2010. Retrieved 17 May 2010. ^ "French Brothers website". Boat-trips.co.uk. Retrieved 17 May 2010. ^ Hart, Dorothy (1 January 2000). "Floating Down the River website". The-river-thames.co.uk. Retrieved 17 May 2010. ^ BBC News, 24th July, 2014 "Deaths in the River Thames reached 15 last year". BBC News online. .
^ "Thames lifeboat service launched". BBC News. 2 January 2002. Retrieved 17 May 2010. ^ Port of London Authority. "Terminal locations". Archived from the original on 27 May 2008. Retrieved 12 May 2008. ^ Port of London. "Thames Bylaws 2012" (PDF). p. 20. Archived from the original (PDF) on 5 March 2014. Retrieved 24 February 2014. ^ "Victoria County History of Oxfordshire: Rivers and river navigation". British-history.ac.uk. Retrieved 17 May 2010. ^ Ditchfield, P. H.; Page, William (1906). The Victoria history of Berkshire. [London: Constable]. doi:10.5962/bhl.title.28982. ^ "Reconnecting London with the River Thames". Tideway. Retrieved 18 February 2018. ^ Vidal, John (9 June 2011). "Thousands of fish dead after Thames sewerage overflow". The Guardian. Retrieved 18 February 2018. ^ Jeffries, Stuart (22 July 2014). 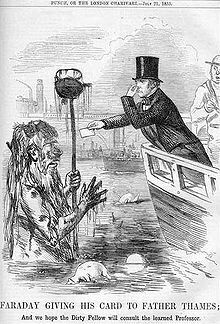 "Water, super-sewers and the filth threatening the River Thames". The Guardian. Retrieved 18 February 2018. ^ "'Super sewer' plans to go ahead". BBC News. 12 September 2014. Retrieved 18 February 2018. ^ "Reconnecting London with the River Thames". Tideway. Archived from the original on 18 February 2018. Retrieved 18 February 2018. ^ "Clubs celebrate £17.4 million Inspired Facilities funding". British Rowing. 22 December 2011. ^ Lewis Pugh (May 2010). "Achieving the Impossible. A Fearless Leader. A Fragile Earth". Simon & Schuster. ^ "New by-law bans swimming in River Thames". BBC News. 30 June 2012. Retrieved 1 July 2012. ^ "The Big Thames Open Water Swim Series". Macmillan Cancer Support. Archived from the original on 28 March 2012. Retrieved 1 July 2012. ^ "Humanrace: Windsor". Speedo Open Water Swim Series. Retrieved 1 July 2012. ^ "The Henley Swim". Retrieved 1 July 2012. ^ "Walliams reflects on epic 140-mile Thames charity swim". BBC News. Retrieved 1 July 2012. ^ See above events, shallow bathing areas and metal steps by certain houses on geograph.org.uk. ^ Smith, Patrick (24 June 2016). "Independence Day: Resurgence and Brexit: the most brilliant movie marketing ploy of all time?". The Telegraph – via www.telegraph.co.uk. ^ "Harvard University Press: The Wind in the Willows: An Annotated Edition by Kenneth Grahame". Hup.harvard.edu. Retrieved 12 April 2010. ^ "Kinks Song List". Kindakinks.net. Retrieved 2 April 2012. ^ You Know Where To Find Me Archived 17 October 2012 at the Wayback Machine. Imogen Heap. Retrieved on 17 July 2013. ^ Canvey Island's 13,000 refugees. (2 February 1953). The Guardian (London), p. 1. Retrieved 29 July 2008. ^ "Canvey Island Drainage scheme 2006". Environment agency. (May Avenue Pumping Station information board). Milne, Gustav; Martin Bates; Mike D. Webber (June 1997). "Problems, potential and partial solutions: an archaeological study of the tidal Thames, England". World Archaeology. 29 (1–special issue, "Riverine archaeology, " ed. James Graham–Campbell): 130–46. doi:10.1080/00438243.1997.9980367. ISSN 0043-8243. Wikimedia Commons has media related to River Thames.